Irish Whiskey is making a comeback, and it's bigger and badder than ever. While Teeling's history dates back to the end of 18th century, it opened it just opened its first distillery in Dublin after 125 years. This 24 year old reserve is everything that an Irish Whisky should be. Triple distilled and finished in Sauternes casks, only 5000 bottles of this Whiskey exists. 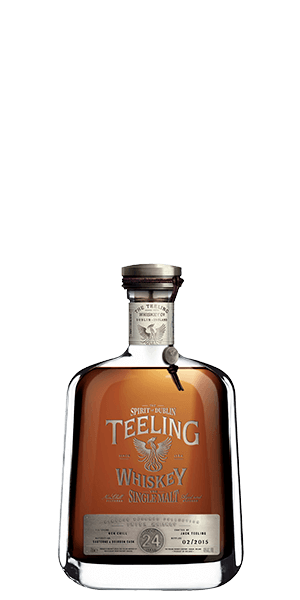 What does Teeling 24 Year Old Vintage Reserve taste like? The Flavor Spiral™ shows the most common flavors that you'll taste in Teeling 24 Year Old Vintage Reserve and gives you a chance to have a taste of it before actually tasting it. Sultanas, fresh grass, apricot, and cream. Silky with white chocolate, figgy and pudding.